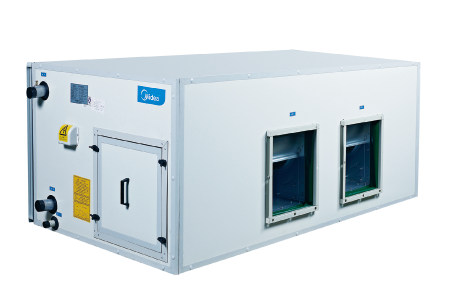 Suspended Type AHUâs air flow rate is available from 2,000m3/h to 15,000m3/h. Horizontal Type AHUâs air flow rate is available from 5,000m3/h to 40,000m3/h. Vertical Type AHUâs air flow rate is available from 3,000m3/h to 40,000m3/h. Suspended Type Air Handling Unit adapts unitary structure design, more outstanding cold-bridge free performance, lower air leakage and more elegant appearance. Different external static pressure (ESP) can be customized to meet different kinds of applications. Panels are double-skin with injection of high density polyurethane. The outer skin is anti-corrosion color-coated steel sheet, the inner skin is galvanized steel sheet. The unit cabinet consists of panels attaching to each other by combining with male and female aluminum alloy cards and sealing strip, tighten with concealed bolts. The outer skin is colored steel sheet with anti-corrosion coat and is cleanable; the fastening bolts are concealed by plastic caps. The outer layer of film prevents panels from scratching during unit assembling and transportation. Clear, smooth and color coordination appearance make the outlook attractive. Heating, air inlet 21°C DB, entering water temperature 60°C, water temperature difference 10°C.